The February round of The Challenge features the theme of Community. Here on the east coast of Australia, a surf club is a fitting community theme. Almost every beachside suburb has its own surf club, where whole towns come together not just for the water sport, but for Surf Lifesaving, activities for the kids and fundraising for the community. Since my home is currently beach-less, I hopped over to Purple Crayons to set up my very own surf club. 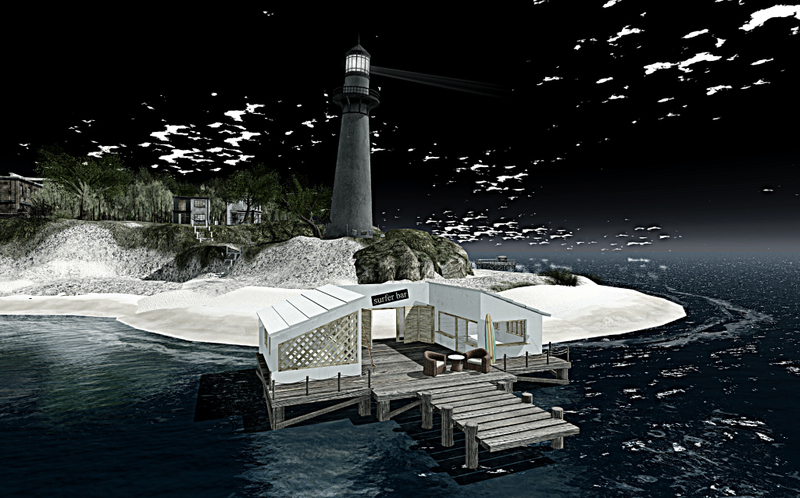 Rwah’s second sim is now open, and anyone can rez there to take photographs. There is a generous 30-minute auto-return set, so you should have time to set up and shoot before stuff starts mysteriously reappearing in your inventory. Honestly, the sim is picturesque enough to not have to worry about setting up your own scene, but it’s wonderful to have the location available for those times when your home or platform just won’t do. Grab your board and join me; I’m done watching and surf’s up. and yes…thanks, will visit your friend Rwah’s place soon. I love The Lost Town but Purple Crayons is my favourite!